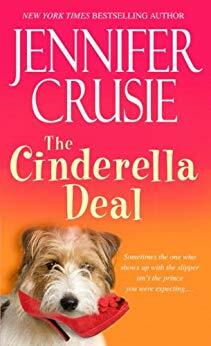 The Cinderella Deal is an Amazon Daily Deal today, Friday, December 7, which means you can get it for $1.98. Never let it be said that I’m not cheap and easy. This book is one of my most favorite comfort reads when I really need a psychological pick-me-up. I’ve already gone through two copies! I love this book. I can’t say how many times I have reread it. In my zone, some of the ebooks are going for $2.89. I just bought 4. I love this book. Right up there with Strange Bedpersons and Welcome to Temptation as my comfort reads. Wasn’t certain I had this on my kindle, because I’m not at home to check. I ordered it, and it went through so that’s good. Oh, heavy sigh! I looked at my Kindle Library and there seemed to be a dearth of Crusie. How could this be? I think your books were once sold by an ebook vendor (Fictionwise Ebooks, I think) who was purchased by Barnes & Ignoble, who closed it. I bought over 300 titles from them, the majority of which were downloaded in the MS Reader (.LIT) format. I’m certain I have others that survived computer death by residing on thumb drives or external hard drives, or even on one of the Kindles. You’re missing my favourites – isn’t it funny how we all have different comfort reads? I like WTT and Faking It and Agnes and Maybe This Time best. but also for comfort I go back to Anyone But You and Charlie All Night. I love women (authors) who are cheap and easy. One of my favorites to reread. This was one of my favorite rereads, now it’s one of my favorites to re-listen-to, and in fact, I just finished it again as I cleaned up following our 7.0 earthquake here in Alaska. I already have it or I would have jumped at the chance to get it for that price!